Scores of advanced video displays from LG Electronics fill the halls of the 2017 NAB Show this week in Las Vegas, where more than 100,000 attendees gather to experience the convergence of media, entertainment, and technology. LG is providing more than 160 advanced 4K Ultra HD screens, ranging from 43- to 75-inch sizes throughout the Las Vegas Convention Center, for wayfinding and information, and displaying stunning 4K video. The National Association of Broadcasters (NAB) named LG Electronics USA the exclusive “Official 4K Ultra HD Display Partner” for the 2017 NAB Show. In addition, the LG Business Solutions division was selected to provide Ultra HD displays for the “NextGen TV Hub: Powered by ATSC 3.0,” a large exhibit in the convention center’s Grand Lobby. 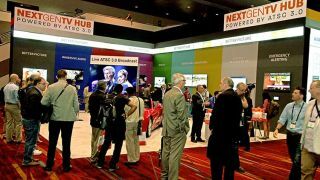 The NextGen TV Hub, presented by NAB, the Consumer Technology Association, and the Advanced Television Systems Committee, is the NAB Show’s center for all things related to the new broadcast standard known as ATSC 3.0. Commercial displays from LG Business Solutions represent the core of the exhibit design, meeting the industry’s goal of telling the “Next Gen TV” story in fresh new ways. Surrounding the top of the 35-by-45-foot booth are nine 86-inch LG “Ultra Stretch” signage displays (86BH5C) daisy-chained together horizontally. Each display measures just over seven feet long and about two feet high for a 58:9 bar-type display. Graphics and animation, with ticker-type messaging and moving images produced by Arland Communications, traverse across the LG Ultra HD ribbon display, drawing attendees into the booth while delivering key messages about the future of television with Next Gen TV. On the side of the booth facing the busiest aisle in the Grand Lobby is a video wall tower using a half-dozen LG 55-inch 55VH7B displays, displaying animated graphics depicting the 20-plus building blocks of the ATSC 3.0 standard, built from the ground up. The centerpiece of the NextGen TV Hub is a new LG 65-inch 4K UHD TV with integrated ATSC 3.0 reception capability, a product designed for launch this year in South Korea. It is receiving and displaying live ATSC 3.0 broadcasts of 4K content transmitted via KLSV-TV from Black Mountain. The booth also features 65- and 55-inch LG OLED 4K TVs explaining immersive audio and automotive applications of the new broadcast standard. In addition to more than two dozen LG 48-inch screens greeting attendees at hundreds of technical and business sessions, 75-, 60-, and 55-inch LG displays are playing a key role in the NAB’s Futures Park in the North Hall where, among other things, the NAB’s PILOT initiative is demonstrating interactive content capabilities of its ATSC 3.0 Home Gateway on LG 4K UHD TVs. LG 60-inch 4K UHD TVs will showcase award-winning creative work of faculty and students at the Broadcast Education Association (BEA) Festival of Media Arts. BEA also is leveraging LG displays to take research presentations to the next level with digital poster sessions. College faculty and students are presenting interactive research on 60- and 55-inch LG 4K monitors in BEA’s exhibit hall located in the Las Vegas Westgate Convention Center. LG OLED TVs were also featured at the NAB Show Television Luncheon on Monday and NAB Show Technology Luncheon (co-sponsored by LG) on Wednesday. LG OLED TVs were also used in private demonstrations conducted by the AWARN Alliance, Pearl TV, and others, while show exhibitors including GatesAir and Dolby also are featuring LG 4K Ultra HD TVs.